Cute Jewelry Sets with FREE Couples Keychain Sets! Items not collected/received by 22 Feb 2019 will be forfeited and no refund will be given. Set includes necklace & earrings paved with rhinestones for a lovely shimmer. Makes for a great gift for special occasions like Valentine’s Day, anniversaries, birthdays and more! 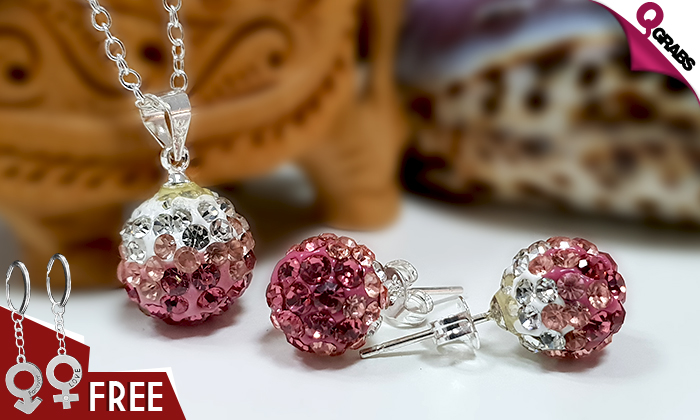 A globe of clear & pink rhinestones in an almost ombre design with silver-plated alloy stud earrings. Set includes love-inspired necklace & earrings paved with rhinestones of either pink or champagne. Silver-plated alloy with dangling hook earrings for a delicate look. Matching key chains for the perfect couple! Symbols of woman and man for you and your favorite couple! Travel with ‘forever love’ close to you! The season of love is almost here with up to 69% off!